A poll published this week provides much needed hope: the British public wants strong action on climate change. People want to see fossil fuel companies and the UK Government held accountable. Individuals know they have a part to play too: two in three say they would install solar panels if there was greater assistance. These figures form part of an important YouGov poll, commissioned by environmental law organisation ClientEarth. The survey reveals that communities want more control over energy production. The poll also reminds us that the Conservative Government is out of touch with public opinion. Ministers have refused to regulate energy giants. Two thirds of the public are in favour of breaking up the stranglehold the main energy companies – known as the ‘Big Six’– have on the market in favour of smaller, cleaner, locally-owned energy systems. Investing in fossil fuels is seen as ‘risky long term’ according to those polled. 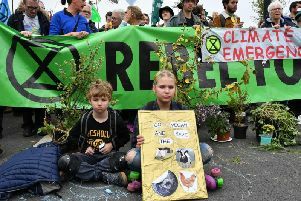 Despite this, the East Sussex County Council pension committee – which has investments in 216 companies that derive some revenue from fossil fuels – has disappointingly ruled out the public call for divestment from fossil fuels. Our limited current use of renewables takes little account of our unique island geography – we are surrounded by wind and sea. But it woefully ignores the climate crisis too. This summer we have seen glimpses of a planet in the throes of such a crisis. Fires have raged through the countryside here and across the northern hemisphere, with climate change meaning such heatwaves are three times more likely. This week scientists reminded us that it’s not just the weather but our entire climate that is changing: the thickest sea ice in the Arctic is starting to break up for the first time since records began in the 1970s. Stronger action has never been more needed when it comes to climate change and this week we’ve been reminded there is still hope. We repeat our call to the Government: show leadership and urgently embrace renewables. Above all- urgently change direction and abandon the addiction to fracking and non-renewable energy which will fuel climate change. Cllr Phelim Mac Cafferty is the convenor of the Green Group on Brighton and Hove City Council.